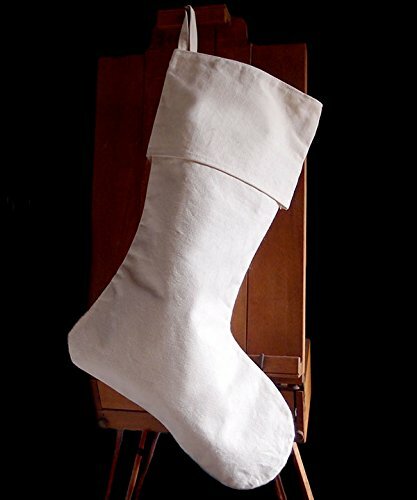 Natural canvas 24 inch Christmas stocking. Measures 14" wide (at the bottom), 10" wide (at the top) and 24 inches tall with a 3 inch loop for hanging. Folded top cuff is 10" wide x 6.75" tall. Made with 100% cotton canvas. There are plenty of great Christmas stockings in stores nowadays. Although handmade Rustic looking Burlap, Canvas or Linen Stockings are much better because they really invite stuffing. Natural canvas 24 inch Christmas stocking. Plain color for personalize handmade projects. Made with 100% cotton canvas. Beautiful holiday decor for Christmas and special occasion! Measures 14" wide (at the bottom), 10" wide (at the top) and 24 inches tall with a 3 inch loop for hanging. Folded top cuff is 10" wide x 6.75" tall. Shipped & Sold exclusively by AK Trading Co.